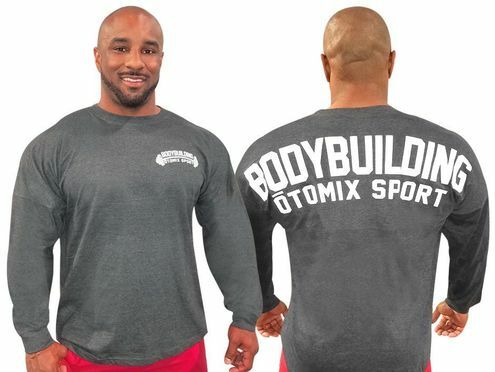 New long sleeve tee from Otomix original "Bodybuilding Sport" line. Midweight with plenty of stretch for comfort and style. 60/40 cotton/polyester. Front includes the barbell "Bodybuilding Otomix Sport" on the left chest, while the backside is designed with the giant text stretched shoulder to shoulder. Try this long sleeve tee and be part of Team Otomix. *THESE LONG SLEEVE TEES RUN BIG. WE RECOMMEND YOU ORDER A SMALL IF YOU ARE A MED, AND SO ON! During Olympia, our Team Otomix Athletes that are an Otomix XXL, fit perfect in the single XL. Please order accordingly.